Collected by the US organzation, CODEPINK, the Honduras Solidarity Emergency Fund is an ongoing fund to support activists who are targeted by repressive government forces or need funds to promote critical actions. Ever since the 2009 coup, Honduras has been beset by a wave of violence that has led to the harassment, imprisonment, and murder of environmental activists, indigenous leaders, journalists, labor leaders, and students, among others. The most well known was Berta Caceres, who was murdered on March 3, 2016. Despite the risks, activists continue to struggle against a repressive regime that is reinforced with US tax dollars to the very military and police forces that are committing human rights abuses. Please stand with these brave activists by generously supporting this Emergency Fund. Every six months, the Honduras-based coordinator of the Honduras Solidarity Network will report to donors on how the money is spent. A delegation visiting Austra Berta Caceres, the mother of indigenous leader Berta Caceres Flores, in her home in la Esperanza. 2012. 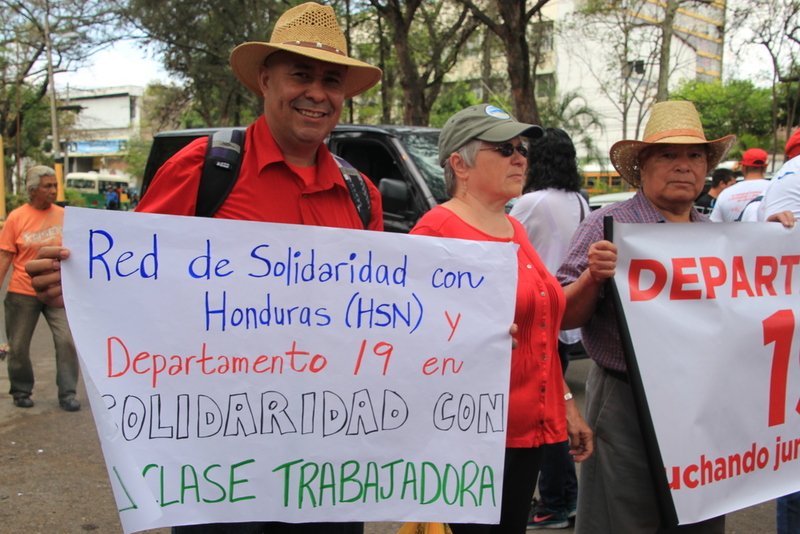 May day march in Tegucigalpa with Honduran members of the HSN. May 1, 2015.